The cradle of Western civilization, Athens is a place of contradictions, and each set on top of the other. There’s the Parthenon, soaring gloriously above the city, whose urban renewal may have begun with the 2004 Olympics but is still in full swing. The land of gods, goddesses, and some of the history's greatest philosophers, also boasts spellbinding ancient temples, such as the Acropolis and beautiful beaches. One of the best things to have happened to Athens hotels’ guests is that cars have been banished from what was once a rather chaotic historic center. Today, the most significant ancient sites are on Europe’s longest and most beautiful pedestrian promenades. Good food is a plentiful in the Greek capital. Though the traditional tavernas still thrive, hotels in Athens are quick to direct you to the burgeoning creative Greek cuisine, offering a modern spin on the old. Below find a list of our selection of boutique and luxury Athens hotels. 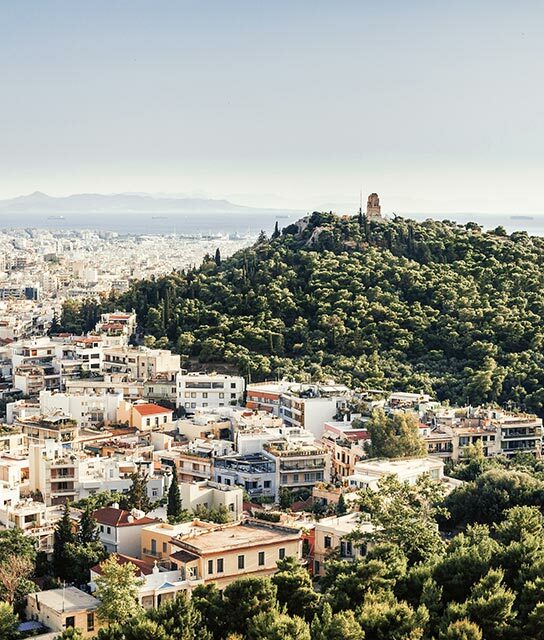 Experience the sleek designs of heavyweights such as Philippe Starck and Zaha Hadid fused with the ancient splendor of Athens. New Hotel, in the heart of modern Athens, is a true Gesamtkunstwerk - uniting all the senses in an intensified visual, tactile, and somatic synergy. High above Athens most opulent shopping district, Periscope Hotel is an intimate urban hub of contemporary art and sight-seeing from the perfect vantage point. Situated in the leafy, upscale Kifissia district of Athens, Semiramis is what happens when you give a hot designer total control. Cool-eyed dedication to modern luxury makes AthensWas hotel a welcome reprieve in the buzzing historic center of this Greek megalopolis. A neo-modernist marvel, Perianth Hotel celebrates contemporary Greek culture in the heart of its ancient capital, Athens.